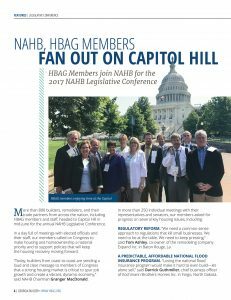 More than 800 builders, remodelers, and their trade partners from across the nation, including HBAG members and staff, headed to Capitol Hill in mid-June for the annual NAHB Legislative Conference. 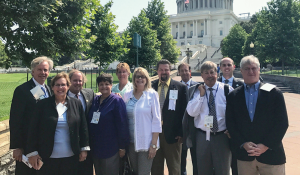 In a day full of meetings with elected officials and their staff, our members called on Congress to make housing and homeownership a national priority and to support policies that will keep the housing recovery moving forward. 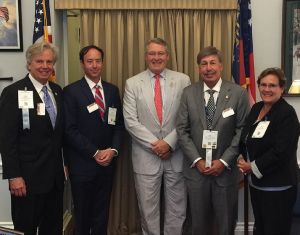 “Today, builders from coast-to-coast are sending a loud and clear message to members of Congress that a strong housing market is critical to spur job growth and create a vibrant, dynamic economy,” said NAHB Chairman Granger MacDonald. 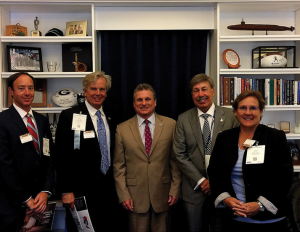 In more than 250 individual meetings with their representatives and senators, our members asked for progress on several key housing issues, including: REGULATORY REFORM. “We need a common-sense approach to regulations that kill small businesses. We need to be at the table. 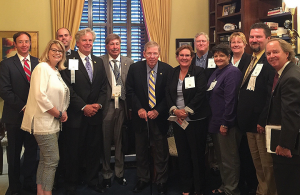 We need to keep pressing,” said Tom Ashley, co-owner of the remodeling company Expand Inc. in Baton Rouge, La. A PREDICTABLE, AFFORDABLE NATIONAL FLOOD INSURANCE PROGRAM. “Losing the national flood insurance program would make it hard to even build—let alone sell,” said Darrick Guthmiller, chief business officer of Kochmann Brothers Homes Inc. in Fargo, North Dakota. HOUSING FINANCE REFORM. “We need to talk about the future of housing finance. That is the key, critical issue here in Tulsa,” said HBA of Greater Tulsa director of association issues Stacey Bayles. Members also discussed tax reform, including protecting incentives for home ownership, cost-effective energy codes, securing a supply of softwood lumber, and the future of the Low Income Housing Tax Credit, key to meeting the nation’s acute need for affordable rentals. Rep. Peter Roskam (R-Ill.), who sits on the House Ways and Means Committee, spoke to builders before they met with their lawmakers and said that this year there is “a real opportunity to do something about tax reform.” House Republicans are working on a tax reform blueprint that would generate economic growth, simplify the tax code, stop erosion of the U.S. tax base so that it is no longer more attractive for U.S. corporations to go overseas, and provide permanency to the tax code to deliver certainty to the business community, Roskam said. 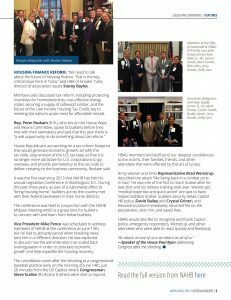 It was the first year since 2013 that NAHB has held its annual Legislative Conference in Washington, D.C. During the past three years, as part of a nationwide effort to “bring housing home,” builders across the country met with their federal lawmakers in their home districts. 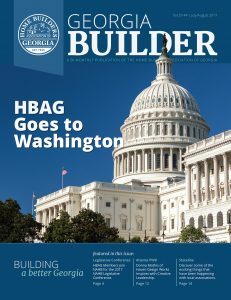 The conference was held in conjunction with the NAHB Midyear Meeting which is a great time for builders to connect with and learn from fellow builders. Vice President Mike Pence was scheduled to address members of NAHB at the conference on June 14th, but he had to abruptly cancel when breaking news sent him in a different direction. He was expected to discuss how the administration has scaled back overregulation in order to stimulate economic growth and help expedite the housing recovery. The cancellation came after the shooting at a congressional baseball practice early on the morning of June 14th, just 20 minutes from the US Capitol, where Congressman Steve Scalise (R-LA) and 5 others were shot or injured. HBAG members and staff send our deepest condolences to the victims, their families, friends, and other attendees that were affected by this act of lunacy. Army veteran and Ohio Representative Brad Wenstrup described the attack “like being back in a combat zone in Iraq.” He was one of the first to reach Scalise after he was shot and his military training took over. Wenstrup’s “medical expertise and quick action” are said to have helped stabilize Scalise. Scalise’s security detail, Capitol Hill police (David Bailey and Crystal Griner), and Alexandria police immediately returned fire on the perpetrator, shot him, and saved lives. HBAG would also like to recognize and thank Capitol police, emergency responders, Wenstrup, and other attendees who were able to react quickly and fearlessly.